What is the Infinity Gauntlet and its Infinity Stones. Did Loki have the mind infinity gem? 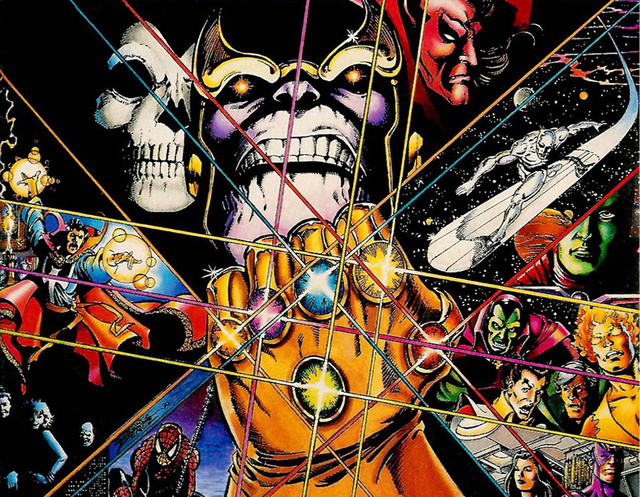 The infinity gems have been around the Marvel universe for awhile and have slowly evolved. They were not all conceived at once. Nor was their initially a plan for them to be on a really cool gold glove that gave the user God like powers. The soul gem appears way back in the "Power Of Warlock" #1 in 1972. The Power and Time gems appear in Marvel Team up #55 in 1977 and all 6 gems finally appear together in Avengers Annual #7 1977. Back in the 70s the gems were never put together on a gauntlet. Soul -Control and manipulates souls, allows you go to a different world called Soul world. Power-RED-Omnipotence, super power, or rather all the power that ever will be. Mind -BLUE - Access thoughts and dreams of all beings. Can actually access all thoughts in the universe when combined with the other gems. The gems are in the movies however they have not been depicted as gems but rather as powerful artifacts. They also do not correspond to colors of the comics. The Tesseract which represents the space purple gem actually has a blue color in film. Here are the Artifacts that = Infinity Gems. Soul -GREEN- Not Shown in movies yet. Many speculate that the Soul Gem could now have something to do with Hela who is the big bad in the film Thor Ragnarok. This would make sense as Hela is a goddess of the underworld and could certainly use a powerful artifact that controls souls. Its possible that Hela does not have the Soul stone but is in fact the Soulstone she is the Soulstone personified. Time -ORANGE - The time gem is called the Eye of Agamotto and is one of the artifacts of the Sorcerer Supreme it is currently in the hands of Doctor Strange. Space- PURPLE- The Tesseract is a powerful artifact that is shown in Captain America the First Avenger and the Avengers. The Tesseract is brought to Asgard at the end of the Avengers. Effectively, it is currently controlled by Loki now as he is acting as the Allfather and controls Asgard's vault. Even though the Tesseract looks blue it is the same as the purple stone in the comics. Currently in the hands of: Asgard. Loki who is pretending to be Odin technically controls it. 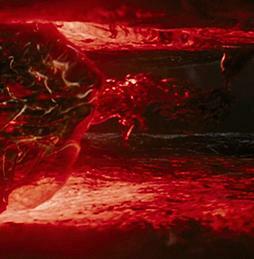 Power-RED- This is the Orb of vaste destructive power found by StarLord in the Guardians of the Galaxy movie. Ronan was able to use the orb to greatly enhance his own power as well as giving him the ability to wipe out all organic life on a planet. The Orb appears purple on film however it is the Red Power gem in the comics. Currently in the hands of: Nova specifically Nova Prime after the events in the GotG movie. Reality - YELLOW- Aether-Shown in Thor 2 and it was given to the Collector. The Aether I initially thought was the powergem due to its destructive capability. I now believe it is the reality gem. It works by switching matter to Darkmatter and thus altering reality. Malkith was trying to use the Aether to alter the reality of the world to more suited to the Dark Elves. I could see an argument that due to its attaching to a person that it is the Soulgem. For now I am keeping it as the reality gem. Currently in the hands of: The Collector. In the after credit scene of Thor 2 we see Volstagg and Sif give the Aether to the Collector who also confirms it is an infinity stone/ gem. Mind -BLUE - An early post of mind speculated that the Mind Gem was in the Chitauri Scepter: Where is the Mind gem? This theory is confirmed in Age of Ultron. Thanos gave Loki the Chitauri Scepter that included the mind gem. After Avengers 1 SHIELD gains control of the scepter but it is quickly stolen by Hydra. The leader of Hydra Baron Von Strucker begins using the gem to create both enhanced people and also to work on an advanced AI. Tony Stark and Bruce Banner begin to study the scepter and use it to create an advanced AI called Ultron. Ultron goes berserk and tries to destroy all life on the planet. During his attempt to eliminate all life on Earth, Ultron seeks to create his own upgraded version and using an advanced android body and the mind infinity stone creates Vision. The Vision is found to be worthy of holding the stone by Thor. Vision is literally shown being able to lift Thor's hammer which highly impresses Thor. At the end of the Avengers Age of Ultron, Vision retains control of the mind stone. Thanos says in the mid credit sequence of Age of Ultron that now he must do it himself. Indicating, he had planned for the mind stone to lead to the destruction of life on Earth. 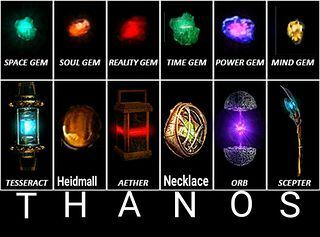 There is a theory that item's name in each film will eventually spell out Thanos. H the soul stone was initially thought to be Heimdall however as Thor Raganorok looms many think that Hela will in someway be the Soulstone. Did Loki Have the Mind Gem? Where is the Mind gem? The year before gems were put onto a gauntlet there was this terrible but kind of awesome product called the Powerglove. Every kid wanted the freaking powerglove it looked awesome in advertising. The problem with the glove was that it was expensive and it functioned terribly. Word of mouth took over quickly and parents stopped buying the silly thing for the kids even though we often begged and begged. Even though the glove failed, the idea of it was kind of awesome. There is of course the movie the Wizard which is basically a giant advertising campaign for the Powerglove. I may be the only person alive that remembers seeing that movie in the theaters. 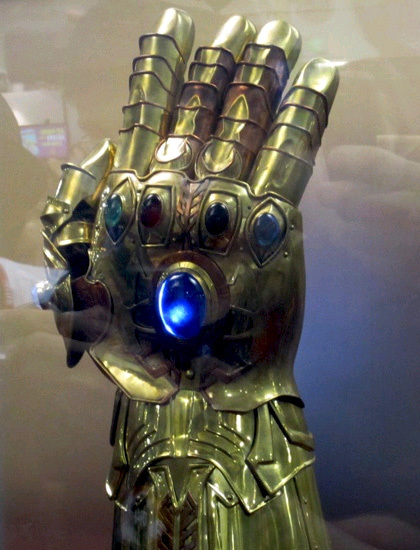 The glove looks amazing in the movie. The villain uses it throughout the entire movie, while looking awesome. My gut tells me at some point some one at Marvel saw this and thought wow wouldn't it be awesome if we made a Power Glove in comic books. Some other guy at Marvel was like yeah what if we put the infinity gems on it. They were Like WOW. Lets have an giant EVENT COMIC about it and the Infinity Gauntlet was born. The gauntlet combines all of the gems in one place. It looks really cool and gives the user near God like power. Typically, the person seeking the Gem has been the mad Titan, the super super super villain Thanos. 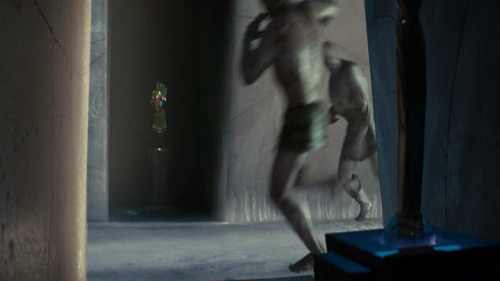 The Gauntlet can be seen in the movie Thor in the Asgard Trophy room. By the end of Thor 2 it is effectively controlled by Loki.